Of his thirty-three years in the US Army, retired Lieutenant General Michael Flynn spent five years in combat, and I’ll bet that he never saw an enemy so vile and repugnant as the ones he encountered when he came home, the ones in the FBI who set him up and bankrupted him. Gloating over his boldness and cleverness, disgraced former FBI Director James Comey, hereinafter referred to as James Scummy, discussed on camera and before a live audience how he set up unsuspecting, trusting National Security Advisor Flynn to make a simple misstatement, label it a lie, and then charge him with a felony for lying to the FBI. While FBI Deputy Director Andrew McCabe convinced Flynn he wouldn’t need an attorney present during the interview because it was more like a chat among friends, not an interrogation, Flynn went with it, and Scummy sent Peter Strzok and another agent in for the kill. While Scummy describes how he unethically, and illegally, I believe, set up Michael Flynn, the audience applauds and howls with laughter. These are Americans. They are also morons. If Scummy could do that to General Flynn, do they doubt for a second that he could and would do that to them? The following hypothecal interview is how easy it is to be caught in a perjury trap by the FBI…. FBI: You understand you are under oath? FBI: On such-and-such a date three years ago, you met an old Army buddy at so-and-so diner for breakfast. Do you remember that? Flynn: Yes, I do. It has been a long time, but I do remember that meeting. FBI: What did you order for breakfast? Flynn: I’m sure it was bacon and eggs. That’s what I always order. FBI: How were your eggs cooked? Flynn: Over easy, as usual. FBI: Just bacon and eggs? What else? Flynn: Wheat toast and coffee. FBI: Thanks for your time. We’ll get back to you. 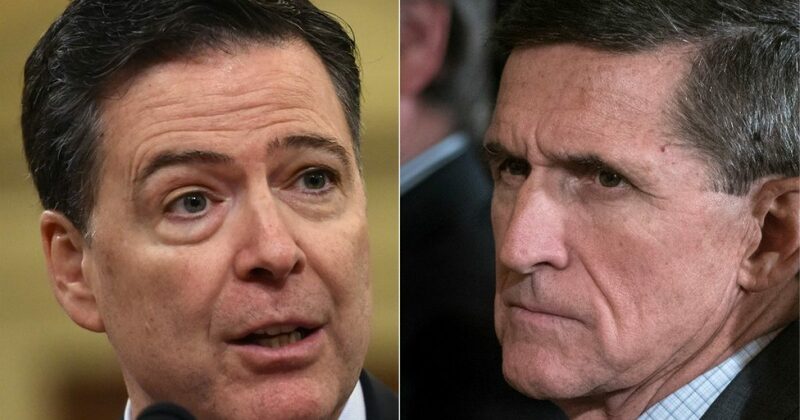 The next thing you know, Flynn is being offered a plea deal because he didn’t remember that the diner was out of wheat toast that morning and he had white toast instead, and the FBI has the receipt from the diner. Perjury! I am hoping this video puts Comey in a cage for the rest of his miserable life! but "it's early enough, let's just send a couple guys over. So we called Flynn, said we're sending a couple guys over, hope you'll talk to them. He said, sure. Nobody else was there. They interviewed him and he lied to them." He ADMITS he didn't tell Flynn what they'd discuss. President Trump can only fight so many battles at one time. He is being assaulted on multiple fronts and must choose his battles wisely. Whether you think he is doing enough or not, rest assured he is doing what he can. No one else could possibly do more. And, who is the lead interviewer Comey sent to set up Flynn? Trump-hater supreme Peter Strzok.